At the opening of the Pop Art Photo Show at the Barker Hangar in Santa Monica in September, musician Mike Shinoda made illustrations on the wall, photographers Neil Zlozower, Dennis Morris, Connie Conway, and Glen Wexler displayed their original photographs, and collector Zach Merck shared his movie posters. The artists talked to us about their art making process, while Shinoda made live drawings for the audience. Shinoda started with outlines using blank paint, then started to take the crowd’s suggestions. 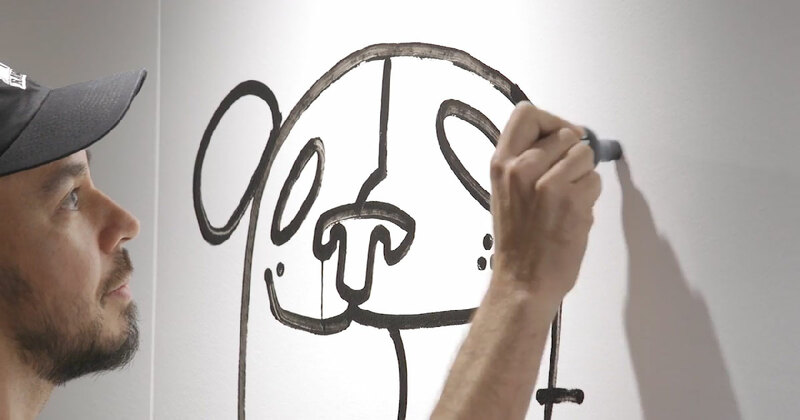 A fan showed him a picture of their dog, and he drew it on the wall in his own style. Once the outlines were finished, he invited all of the fans to participate and color them all in. Spectators were welcome to color in the work throughout the weekend. See how this collaborative art piece was inspired by Shinoda’s most recent album, Post Traumatic, and hear rock-and-roll photographers talk about their subjects.